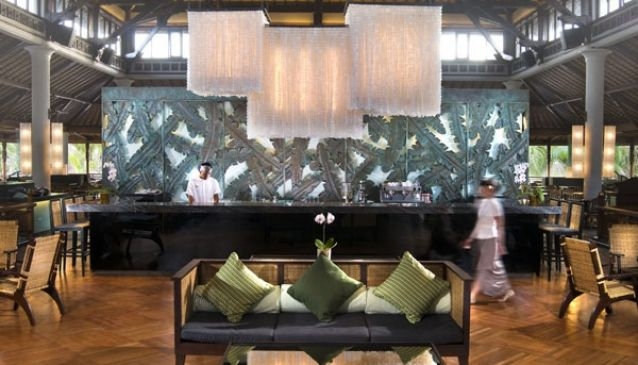 Known as a five-star art sanctuary, Padma Resort Bali is a serene paradise overlooking the renowned Legian Beach. Just minutes away from the nearby traditional art and fashion markets and many restaurants, the resort is a sanctuary at one with nature. Koi fish ponds abound, and the Koi have been well chosen for their stunning colours. Some will eat out of your hand. Children just love this new game. Evenings are a pleasure, watching the sunset with a cool beer or cocktail in hand. In the heat of the day, glide up to the Pool Bar, where you 'don't dress up' because you are seated in the water. There is a superfluity of onsite sport, but the paved walk in front of the hotel is a jogger's delight, as is the gleaming white beach. Try your balance on one of the surf boards for hire; there are instructors on hand. Meals at Padma are a particular delight; you probably won't want to eat out at the many restaurants along the Beach Walk, but might as well know they are there, representing many nationalities and local cuisine.